October 2017 marks the 5th year the IBSSS Mary Ingalls Society has been working with the Iowa Braille and Sight Saving School. It is also time to renew memberships. With that in mind we thought we would share some highlights from this past year. It has been a busy year that has brought over 600 people, from many other states as well as Iowa, through the front doors of Old Main. The number includes 6 bus tours and at our October 15 “Prairie Fiddle” show in the Auditorium. In October 2016, through our “Lot 31 Project”, we dedicated a monument and headstones at Evergreen Cemetery in Vinton. They now mark the graves of students from the School who had been laid to rest there in the late 1800s and early 1900s without permenant monuments. October 2016 also saw us making a presentation to the Iowa Board of Regents outlining our position on the disposition of historical artifacts and records for the School in light of the Board’s decision to sell the campus property. Our focus centered on the preservation of Old Main and maintaining the historically significant items there. Throughout the year we continued the work of cataloguing and preserving historic records and photos. We used grant money obtained through the Benton County Community Foundation and your generous membership gifts on the following projects. 60 VCR tapes were digitized for easier viewing and use. Newspaper and scrap book articles dating from the 1950s through the 1980s were moved from folders in file drawers to acid free clear protective sleeves and stored in acid free boxes making them easy to view and available for use in displays and programs. Some of these articles accompanied us to a presentation at the State Lions Meeting in Cedar Rapids in June. Acid free sheets for photos are now being filled to further enhance their preservation and ease of use in displays. Additional storage boxes have also been purchased and filled with various archival materials. In May 2017 we marked our second year for the Vinton-Shellsburg 6th graders to visit the campus. We are excited to tell you there are plans for the next group to visit in May 2018. The School also hosted a group of secondary students belonging to a group called, Future Leaders of America. Making this school connection has been a goal of ours since the beginning, and we continue to look at ways to expand our outreach to other schools in Benton County and beyond. We participated in and had a display for the Rare Book event held at the Cedar Rapids Library. This year has also marked a continuation of a great working relationship between the Mary Ingalls Society and the School’s alumni. They have been valuable allies in working on preservation of artifacts and have proven to be the highlights for many of our tour groups. None of this work would have been possible without the participation of the IBSSS Mary Ingalls Society’s members/supporters. We sincerely thank you and invite you to renew your membership/support. If you are not a member, we invite you to join us in this work. Below is a release from the Mary Ingalls Society in Vinton. The IBSSS Mary Ingalls Society hosted a record 10 bus tours this summer and fall. We also welcomed 120 Vinton-Shellsburg 6th grade students in May as well as many other groups and individuals. The total is just shy of 900 people. There are already tours pending for this coming summer. Recent news of the possible sale of the Iowa Braille and Sight Saving School to the city of Vinton or some other entity has caused many of us to come to the realization this School which has been part of the community fabric for 154 years could cease to exist. It has also made the IBSSS Mary Ingalls Society more keenly aware of the need to continue the work of preservation and cataloguing artifacts. Many hours and several hundred dollars of archival storage and preservation materials have already been invested, but much more remains to be done. Grant money has been secured to assist in these efforts, but they only partially cover what is needed. The IBSSS Mary Ingalls Society’s membership and donations from concerned citizens provide the main source of funds and manpower needed to complete this task. The Society is currently seeking new and renewed memberships (at $20.00 per year) as well as donations to continue our work. Checks can be made payable to VCF/IBSSS Mary Ingalls Society and mailed to Box 326, Vinton, Iowa 52349. If you have not recently been or have never been to the school for a visit, this would seem to be the perfect time to do so. The school is much more than a lovely campus with well maintained grounds that you drive by without really thinking about. It is an integral part of our history as a community. Come and let us show you around. You can arrange a time by calling 472-5200 and speaking with either Pat Barr or Yvette Baker. Thank you for considering joining the efforts of the IBSSS Mary Ingalls Society. As part of its ongoing efforts to preserve, honor, and share the history of the Iowa School for the Blind and Sight Saving School, the Mary Ingalls Society has identified a section of the local cemetery where students from the school were buried. They have determined the names of these students. As we previously reported, they raised funds for a marker. They successfully raised the amount and now the marker is in place. If you have any information or questions, please contact Pat Barr at Iowa Braille 319-472-5221 x1110 or email pbarr@iowa-braille.k12.ia.us. In the 1800s a burial lot was purchased for the Iowa College for the Blind at the Evergreen Cemetery in Vinton, Iowa. Students were buried there through the end of that century, however no marker was ever erected on the site designating it was for students from the school or who they were. Six student names have been identified as being buried in the lot. Two additional students, who died in the early 1900s, have also been identified as being buried across the drive from the school lot. They also have no markers. The Lot 31 Project was initiated in August 2015 by the Mary Ingalls Society to raise funds to purchase a headstone, have it engraved and installed on the lot plus two head markers for the students buried across the drive. The response of the community and friends of the Iowa Braille and Sight Saving School has been amazing. As of 12/18/15 we reached the goal of $6,000.00, and work has begun to order the marker. Keep watching for updates on progress and a dedication date. The Mary Ingalls Society is offering special Mary Ingalls souvenirs for a unique present for your Laura Ingalls Wilder fan for Christmas. The Holidays are rapidly approaching and the IBSSS Mary Ingalls Society has 2 wonderful ideas to assist in your search for the perfect gift. Our 2016 calendar has lovely vintage black and white photos of the school including some buildings no longer part of the campus. The Christmas ornament is designed to mirror the Mary Ingalls School Site signs we have had installed on the Braille School grounds. The calendars and ornaments sell for $10.00 each. They can be seen and/or purchased at the Braille School weekdays from 8 a.m. to 4:30 p.m. They will also be available for sale at Henkle Creek on November 5th and 19th and December 3rd and 10th from 5:30 to 7:30 p.m. If you need to have the calendar or ornament shipped to yourself or someone else, you can call 319-472-5221 between 8 a.m. and 4:30 p.m. Monday – Friday or 319-560-4942 from 5:00 p.m. to 8:00 p.m. any day. The cost of mailed calendars is $13.00 and mailed ornaments are $15.00. You may also call the above numbers if you have any questions about these items. 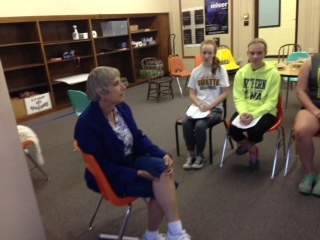 “Mary Ingalls – Her Journey” returns to the Iowa Braille and Sight Saving School for its 2nd Season. Once again the Iowa Braille and Sight Saving School auditorium will provide the setting for the Pageant depicting Mary Ingalls and her life as a student at the school. It provides a unique opportunity to be surrounded by history and watch it at the same time. If you were able to join us for last year’s first ever Pageant production, you will not want to miss this year’s updated version. If you could not be with us last year, you are in for a treat. Construction on Old Main to repair damage done in the windstorm of 2011 is completed, and guests are again able to enter through the front doors. The Founders Room will be available for Pageant guests to see as well as the newly reopened museum on the third floor. Plan to come early and spend some time exploring them. There will be IBSSS Mary Ingalls Society members available to provide information and answer questions. Transportation will again be provided to those needing it to get from remote parking locations to Old Main. Production dates and times are July 31 and August 1 at 7:00 p.m. and August 2 at 2:00 p.m. Doors will open one hour before show time. Tickets are $10.00 and there is general admission seating on the main floor and balcony of the auditorium. Tickets may be purchased ahead of time by going to www.ACTI.org on the computer or at the door. Only 21 days till opening night of “Mary Ingalls – Her Journey” at the Iowa Braille and Sight Saving School. There is lots of activity – lines to learn, costumes to try on, props to find, furniture to move, pictures to take and promotion to prepare. All this energy expended to bring you the story of Mary Ingalls’ time at the Iowa College for the Blind. Be sure to include us in your plans for the weekend of July 31, Aug. 1 at 7p.m. and Aug. 2 at 2:00 p.m in the Old Main auditorium on the Iowa Braille and Sight Saving School campus. Tickets are $10 and are for general admission. Come early and spend time visiting the Founders Room and Museum. GOOD NEWS – www.ACTI.org has been fixed. If you went there earlier thinking you could purchase advanced tickets and were unable to do so, please try again. You can also purchase tickets at the door before each performance. I have to say I didn’t have anything to do with the writing of this show and I was enchanted when I saw it. I especially thought the middle section where recollections of actual students were used to show what Mary’s life at the blind school was like were particularly effective. It helps fill in the big gap in the books about what happened to Mary when she went to school. A big moment is when they reenact Mary’s graduation where it actually happened. Sarah S. Uthoff is the main force behind Trundlebed Tales fighting to bring the History, Mystery, Magic and Imagination of Laura Ingalls Wilder and other greats of children’s literature and history to life for a new generation.Attend one of her programs, schedule one yourself, watch her videos, listen to her podcast, and find her on Facebook, Twitter, Google+, LinkedIn, and Academia.edu. She is currently President of the Laura Ingalls Wilder Legacy and Research Association. Professionally she is a reference librarian at Kirkwood Community College and director of the Oxford (Iowa) Public Library. It’s been a lot of work but the museum for the Iowa School for the Blind is coming together. The third floor museum was first assembled for the 150th anniversary of the school. It was heavily damaged by the straight line winds and following rainstorm a few years ago. 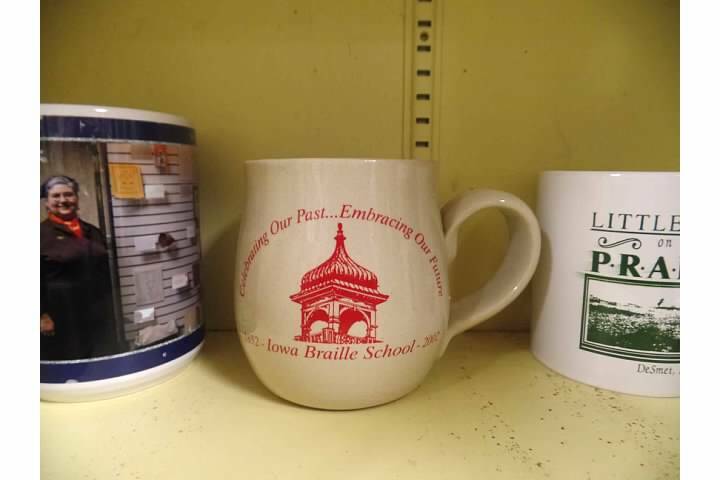 Since then the Iowa School for the Blind and Sight Saving School Mary Ingalls Society has been formed and has been working on preserving and sharing not only the story of its most famous alumnus, but also the story of the school as a whole. Old Main, the original building on campus, is still active as it’s used as the administrative headquarters for services sent to mainstreamed K-12 blind students across the state. Part of the building is also rented out (with more room available if you are looking for a place to set up a business or nonprofit in Vinton) and part is now used as museum space. The Founders Room is right next to the front door and was traditionally used a place to display history and serve as a place for current and prospective students to connect with the school history. In recent years, it had instead been used as an office. The Mary Ingalls Society is grateful that the Founders Room has been returned as the first floor presence of the museum. It now is home to some of the books with Mary’s records and blow ups of the relevant pages for everyone to see. The Mary Ingalls Society has been working on examining what records and history remain in the school’s collections. However, they are hoping to share more of the story of the school from the beginning to the to the present. We’re hoping that you can contribute to the exhibits. Did you ever attend, teach at, or visit the Iowa School for the Blind? Do you have something that would fit in the blind school collection? Do you have technology or books that are obsolete or out of date? Do you have photos or documents that relate to the school that you would consider donating, loaning, or making us a copy? Or do you have anything related to Mary Ingalls, either real or fictional? For example, we’d love to have a collection of Mary Ingalls dolls from various places. Consider sharing them with the school. Remember there is still time to get a commemorative 1st edition Iowa School for the Blind calendar and to block out August 1,2,3, 2015 to make sure you can attend this year’s pageant.